Green Bay police are asking for businesses along Oneida Street to review their surveillance video to see if they can catch a glimpse of a 21-year-old woman who went missing early last Friday morning. Mahalia Xiong was last seen leaving the Ashwaubenon bowling alley alone in her white 1996 Mercury Sable 4-door, after a night out with friends. Lieutenant Dave Wesley says the surveillance videos may catch the car driving by and show if Xiong was being followed, if someone was in the car with her, or if she was not driving her car. Xiong&apos;s disappearance comes less than a month after a UW-Whitewater student went missing in Madison. Kelly Nolan was found murdered last week. Lieutenant Wesley says Green Bay Police have been paying attention to that case, but see no connections at this time. 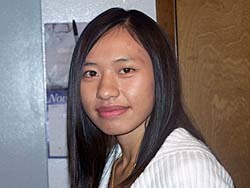 Anyone with information on where Mahalia Xiong may be is being asked to contact Green Bay police.